Graham Priestly looks back to his time as Assistant Production Manager in the Braintree Factory. After getting involved with music through appearing in a Youth Club Show, I learned to play the guitar. I formed a band in 1961 with three of my schoolmates, and we performed in the Lincoln area for several years, till the pressure of work for our 'A' levels forced us to 'retire' I had no real idea what I wanted to do, but because I had built a lot of the group's equipment, and was well known for my ability to repair stuff, I eventually joined the staff of the local music shop, where I was trained as a piano tuner and took on the repair of all types of instrument. I joined another local band as organist, and rebuilt a fire-damaged Hammond C3, which just fitted across the back of their Bedford CF Van. We played all over East Anglia, and had a great time, but after a couple of years I realized that there was little chance of promotion at work, and the rest of the band wanted to tour the Middle East, so I took a job as service manager with Bradley's Music in Sheffield. I soon got involved in the local nightclub scene, and was subsequently offered a job as a DJ in one of the clubs, and later, a Sunday spot on BBC Radio Sheffield. In the summer of 1969, I was sent by Bradley's to one of Selmer's training courses, on Lowrey Organs, at Southend. This was hosted by Lowrey's Technical Manager from Chicago, Wesley Sharratt. By the end of the course, we were getting on well, and I was helping him with the instruction, so it came as no real surprise when Eric Lord, one of Selmer's sales reps, visited me later in the year to ask me to travel to Braintree for a job interview. One other person I remember from the course was Ted ( E.D. ) Brown, who owned a chain of shops in the Colne, Nelson & Blackpool area. Apart from an evil sense of humour, he had a firm belief in the value of properly trained engineers, and insisted on attending the courses himself so he could pass on the knowledge, and check on their work. Eric Lord ended up working for Ted till he retired. I travelled down to Woolpack Lane in the October, and stayed overnight at The Old Court Hotel before being interviewed for the position of Assistant to the Production Manager. I must have answered all their questions adequately, because I received a written offer which I duly accepted. I handed in my notice on Dec 1st, to all three jobs, and spent a very emotional Christmas in Sheffield before moving south. I started on 5th January 1970, on £2,700 a year. When I started work, I was greeted by Mr James, the Production Manager, who ( strangely ) I hadn't met before. I found him OK to work with, as I was really there to deal with the technical problems on the production line and help out with the items returned for repair, so my 'title' of 'assistant' was meaningless. I had no involvement with the actual production, and I hardly ever saw him. 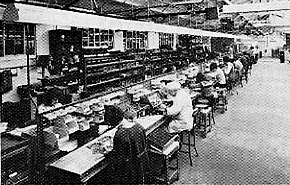 There are two pictures of the 'factory' at the top of this page, but it may not be obvious that they are the same room, viewed from both ends!. The 'conveyor-belt' with the organs was installed a few weeks after I arrived, and helped to prevent damage to the bottom of the cases as they were moved along, on 4' x 2' plywood sheets. When the line was running well, we were assembling up to 40 organs a week, of various models, which sold for between £500 and £1200 in the shops. The larger models were always imported fully assembled, so we never knew much about them, except for when they went wrong. I found that I spent most of my time in the warehouse, the other side of Woolpack Lane, repairing stuff that had been returned, as there wasn't anywhere else to put it. Most of these repairs were things which the dealer's engineers should have been able to fix, but there was no coherent policy on the dealers even having an engineer, and among those who did, there was no real attempt at training. This led to a ridiculous situation which I tried hard to resolve, but no-one would take any notice of what I said, so it just got worse. If, for example, a power transistor failed in the amplifier of an organ, the dealers were allowed to order a replacement amplifier - which we had to get by air-freight from America - and they would then return the faulty one to us. This would have been OK if we had any way to repair it, but in many cases, it was impossible to test them without the rest of the organ, and the models changed so fast we might never see another of that type. When I joined Selmer's, there were over a hundred large sub-assemblies in the stores - all faulty - but with no details of the problems. As far as I know, they were still there when I left, and the replacements had all been invoiced by Lowrey. A little bit of planning and training would have saved all that financial loss. Another problem was that there had never been any attempt to analyse the useage of spares, and no-one ever tried to pre-order the most common parts for stock, so we were paying a fortune in shipping for even the smallest parts, and quite often the dealers were ordering the wrong ones anyway, as they had no technical skills. ( The most common parts were all available for a fraction of the price from Radiospares anyway ) We tried to run a series of technical seminars during the summer, but they were badly supported, as the dealers were reluctant to send anyone away on a course which needed two nights away in a hotel. I tried to improve the training facilities at the factory, but met with little support, and even paid for several visitors' lunches in the canteen myself to make sure they got some! One responsibility was maintaining the instruments used by the sales reps, and this led to me travelling with some of them when they were fairly local. There were two employees with exactly the same name - Brian Leslie Lake - and people were often confused by this, until they decided that the one in the office would use Brian, and the one on the road would use Les. I remember visiting the Barn Restaurant with Brian one Friday night, to meet a trio called The Peddlers, who used an old valve Lowrey which needed some attention. About a week later two people were shot in the same room, and the place became well known for 'The Barn Murders'. Roy Philips of The Peddlers introduced me to his friend Harry Stoneham, who had just started working for Selmers as a Lowrey demonstrator, ( he had been working for Hammond, and eventually went on to run the house band on the Michael Parkinson Show on TV ), and we became good friends. Harry played at Organ Shows for me on several occasions over the next few years, and I occasionally played bass & sang with his Jazz Trio when Pete Morgan wasn't free. Brian occasionally did some demo's locally, and when the new 'Holiday K' model arrived, which had a built-in rhythm unit and automatic accompaniment, he took one down to Chelmsford Town Hall one night to show to the local Organ Club. I met him there with one of the girls from the office, who had become a friend. ( By coincidence, she was from Sheffield, and I later drove her and her belongings back to her family home when she left Selmer's ) Brian also played the Saxophone, and he had planned to do a solo spot with the Organ running on its' own, but neither of the tunes he wanted to play sounded right without any chord changes. He asked me to do the 'dumb assistant' bit and come on stage to press the right key at the right moment, which I duly did, but I then sat down on the stool and started playing the second tune, with him still on the Sax, which he hadn't expected. After that, we developed a bit more of a routine, and spent several days together on Selmer's stand at the Music Trades Fair in London. I remember being asked to do the final inspection on all sorts of repair jobs - not just electronics - and was expected to look for defects in the work of people who had been doing it all their lives. On the whole, the instrument repair team were pretty good, and after some initial embarrassment we got along quite well. I became friendly with the guitar repairers - Eddie Jones and Alf Fidler, and they were surprised to find that I had built my own guitars, had previously owned a Hofner Committee, still owned a Gibson, and could often tell them what they should be doing. Eddie played at the weekends at the Elephant & Castle Pub ( in London ), and I occasionally went up to see him there. One of the lads ( Tony? ) on the speaker assembly line played guitar in a Country & Western and ( I can't remember their name ), who found a ready market at the local American Airforce bases. He approached me one Monday morning to ask if I knew anyone who could play bass, as their regular player had moved away following a marriage breakup. I said I didn't know of anyone, but joked that I'd give it a try myself if they were really stuck. I didn't hear anything more till the Thursday when he came back to say he hadn't found anyone else, and he'd assumed I was serious. The Bass Player's amp was in their van, so I was able to 'borrow' it, and play with them the following night. 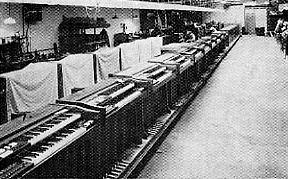 At the end of the factory assembly area there was a stack of 'traypacks' ( the pre-assembled keyboard and electronics for organs ) which had been damaged in transit ( dropped during the unloading of a cargo-plane ). I was supposed to work my way through them and fix what I could. The pile gradually got smaller, till there was only one left ( the only 'Berkshire' in the pile ), and I was waiting for the parts I'd ordered to repair it. The factory fork-lift truck reversed into it and made quite a mess of the packaging, but didn't really do any damage to the contents. I was surprised to see it being moved a few days later, by the same truck, and when I asked what was going on, I was told it had been 'written off by the insurance company', and was being dumped. I think I reached Warp Speed on the way to the office, and when I asked if I could have it 'for spares', I was told that a donation of £20 would be acceptable. It went straight into the back of my mini, and when the spares arrived I bought them as well. We had some wooden cases which had been damaged by water in the stores, and were waiting to be replaced ( another insurance claim ). Although they were for a different model ( the 'Hilton' ), I knew I could make one fit, as the traypacks all used the same basic frame. I spoke to the sales rep from Rawson Sparfields, who made them, and he said they'd keep the best one for me to pick up when they burned the rest, so the next Saturday I drove over to their factory at Haverhill and collected it. They also gave me a pot of lacquer and some veneer to repair it with, and within two weeks I had the complete Organ in working order. I had been asked to provide the music for a local youth club show, and used the rebuilt Organ for all the rehearsals and the two nights of the show, without a hitch. I had repeated the salvage process with a pair of Leslie Speaker cabinets, and re-built some of the bits from my old Hammond's sound system into them, so I had a good set-up for the show. It turned out that the instrument was being used by the house band at The Clarendon Hotel, in Shanklin, and the proprietor was a chap called Herbert Snowball, who I knew from some years before when he worked for John Bloom at the Rolls Washing Machine Co., in Cricklewood. He ran a number of businesses on the Island, including the first Hovercraft Ferry Service to the Island. As a sideline, he also sponsored the original three Isle of Wight Pop Festivals which featured such bands as Hendrix, Dylan, The Doors, The Who, etc. As the year wore on, I became less settled, and after a series of arguments about the way things were being run, I walked out. Les Lake had also left Selmers in the May, after a number of disagreements over sales policy, and he had started up in his own shop. Les had been the Lowrey rep for East Anglia for the previous two years, and had realised that there was an enormous gap between the existing dealers right next to where he lived, just North of Peterborough. With help from his friend ( Mike Robinson ) he rented a small shop in Crowland, about 7 miles from his home, and in the first five months he sold nearly fifty Organs. On one occasion, Les needed some spares, and I offered to deliver them as I drove up to Lincoln for the weekend to visit my parents. He waited at the shop for me to arrive, and I offered to fit the parts while I was there. As I was leaving, he offered me a job if I ever needed one, so when I left Selmers, I took him up on the offer. I have lived in Crowland ever since, but I work on computers now, not musical instruments.